During the periods we spend researching new destinations, many sites will be added to our list. From these, we can glean a finished itinerary that will allow us to showcase a variety of options for our readers to add to their own travel schedule. We are always excited when we uncover one of those places that the locals love, but is off of the beaten path. 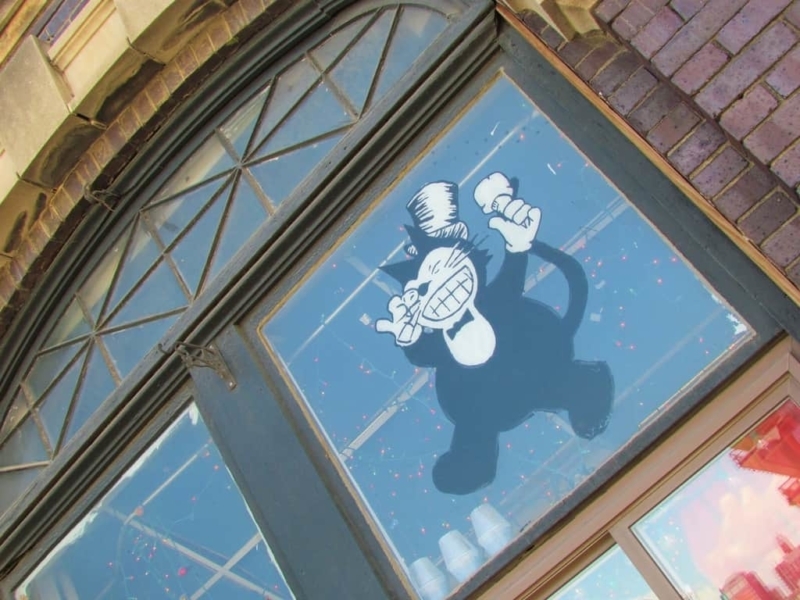 Such is the case for Black Cat Ice Cream, which is located in the Gas Lamp building near Pappajohn Sculpture Park. It’s the kind of place that would be hard to distinguish from a moving vehicle, but since we were afoot, we easily scoped it out. 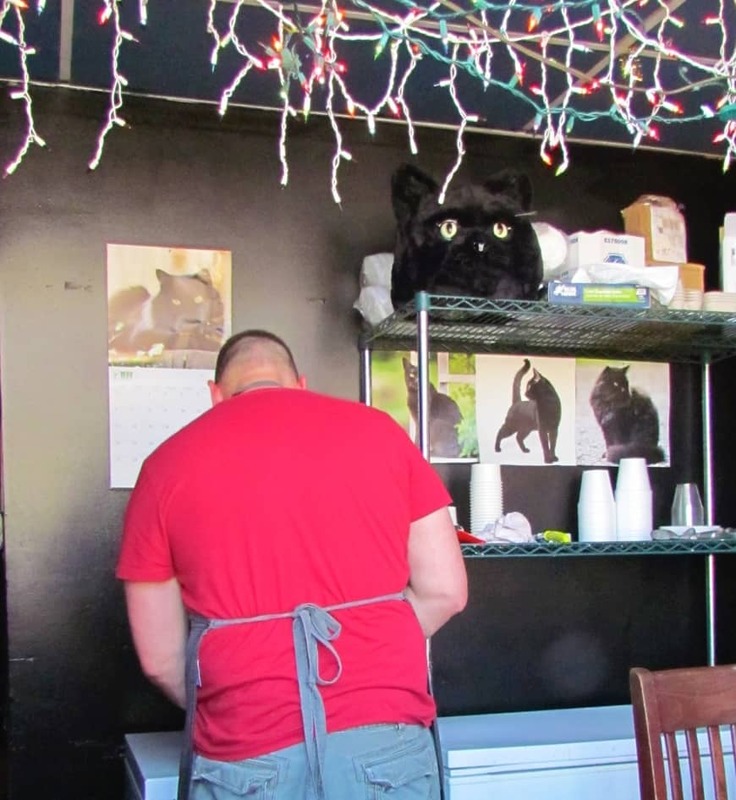 On an unseasonably warm, late spring day, we made our way to Black Cat for a cooling treat. A line was snaking out from the window where the creamy treats were being dispensed. As we approached, we made note of the dishes that people were devouring as they headed away from the building. We knew we had found our secret destination, and that we were in for a true surprise. We want to thank the Catch Des Moines for their hospitality. Rest assured that all opinions are our own. The business operates out of the first floor and service is through a single window. No seating is available, unless you pull up a spot on the sidewalk, like we did. The menu is located on a placard outside the storefront and lists the available flavors for the day. Once a flavor sells out it gets removed from the list. The owner makes up as many gallons as possible and usually sells out. The small batch approach means that the product they offer is of the highest quality. After our visit, we had mentioned to some of the people we met about how much we liked the ice cream. We heard some of the nicest stories about the business and its friendly owner. One of the most touching was that during the coldest part of the winter, he made deliveries to those who couldn’t get out to get their ice cream fix. Now that is true customer service. When we arrived, there was a line to order, but it moved quickly. Alex Carter, owner and ice cream aficionado, was busy serving up some of his homemade specialties to adoring fans. A short lull in the line allowed us to chat with him for a moment. He explained about his fondness for ice cream, and his desire to serve only the best possible product he could produce. That is why his flavors and volume are limited. It allows him better control over the results, as well as giving him a chance to experiment with new flavor combinations. 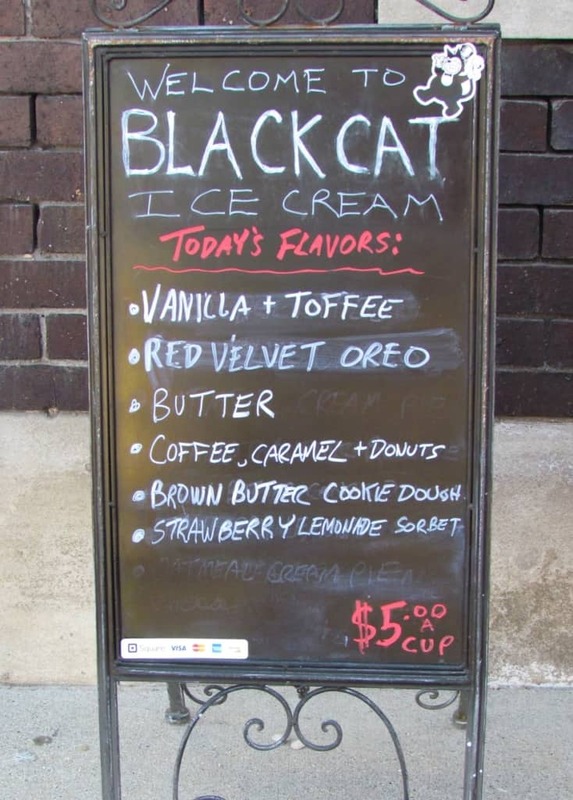 Why Black Cat Ice Cream? Alex told us about his cat (Yes, it is black!) which has a fondness for ice cream. It was an easy decision to connect the two when he began this venture. Pictures of his favorite feline adorn the inside of his shop. After a little more small talk, we decided on the two flavors we wanted to sample. After placing our order, we patiently watched while Alex scooped our treats from his five-gallon buckets of creamy goodness. 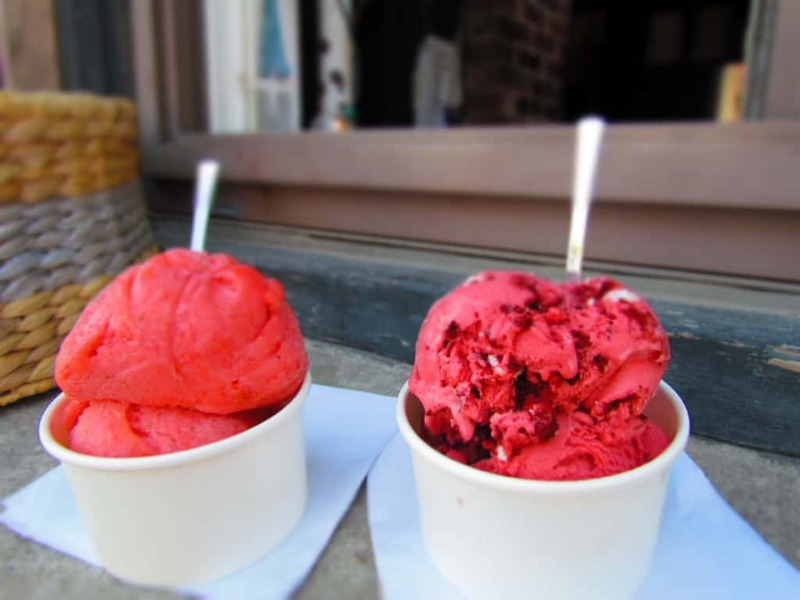 Our decision was to test out one of the cream based flavors, as well as one of the sorbet. Crystal ordered the Red Velvet Oreo, (pictured on the right) which had a wonderful Devil’s food flavor and real chucks of Oreos. The texture was creamy and the cool treat was more than welcome on the hot day. I went with the Strawberry Lemonade Sorbet that featured a mix of the two flavors. It was so creamy and the flavors were well balanced. We found a spot on a nearby stoop and sat down to enjoy our dishes in the shade. We knew that we would eventually have to head back out into the sunshine and heat, but for now we would just savor our desserts from this hidden gem. 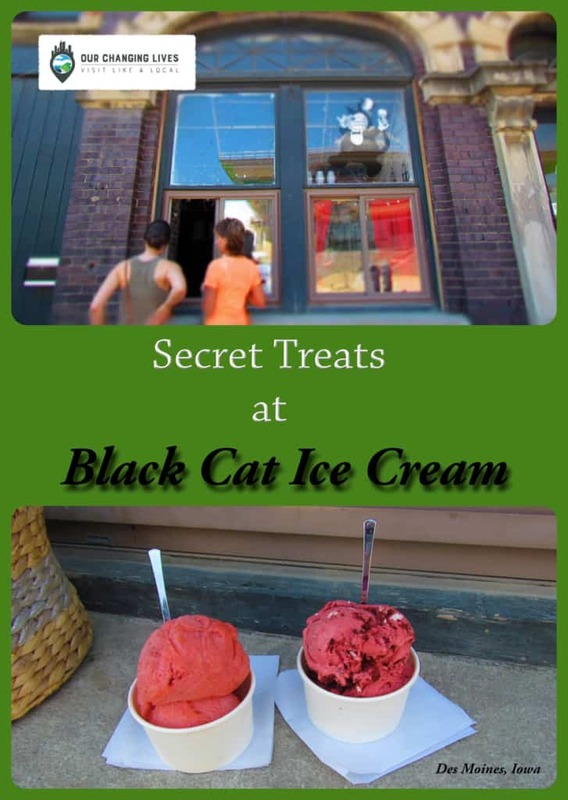 Are you ready to sample Black Cat Ice Cream?